A few weeks back I got asked whether I'd be interested in getting involved with the LoveCravendale campaign and experience one of their Adventure sessions. Now normally I wouldn't say I'm much of a sporty person (unless you count running around at events), but this past summer has been quite a sporty one! I got to run in a triathlon, I went paint balling, I've tried to go trampolining regularly and I've started commuting (I know, I know, not something new for most of you, but this is the first time I've had to do that here in London)! Love Cravendale is the new rewards club from Cravendale (obviously), which allows you to collect points and earn special experiences. They've got a range of experiences: go karting, scuba diving,samba lessons, laser tag, guitar lessons, paint balling, the list goes on and on. So what experience did they select for me? Segway Rally! I shouldn't have worried. Much. The session starts off with a proper instruction and safety briefing, where you get to learn how to ride a Segway. It really is quite weird and still doesn't completely feel natural to me. The more you lean forward and push your weight forward, the faster it goes; to make it stop, you need to move your weight back. What I think threw me more though was the steering: you need to tilt the handlebars to the left and right. I think I'm just so used to bikes that I keep wanting to use it like that (which throws you completely off balance). After the safety briefing, we got to rally! The track was pretty interesting; lots of corners, one "hill" and quite a couple of bumps. You actually end up being able to go quite fast and have a couple of microseconds of air time at certain points on the track! I have to admit I did end up crashing after taking a corner too quick and luckily managed to jump away before I hurt myself. It did give me a bit of a shock though, and I didn't really dare go faster after that. It was definitely fun though! Surprisingly what hurt the most afterwards were my toes. Somehow the leaning forwards and backwards made me use my toes much more than normal. Who would have thought? If you're interested in having your own adventure experience, check out the list on the Love Cravendale site. Disclaimer: this article is sponsored by Cravendale. 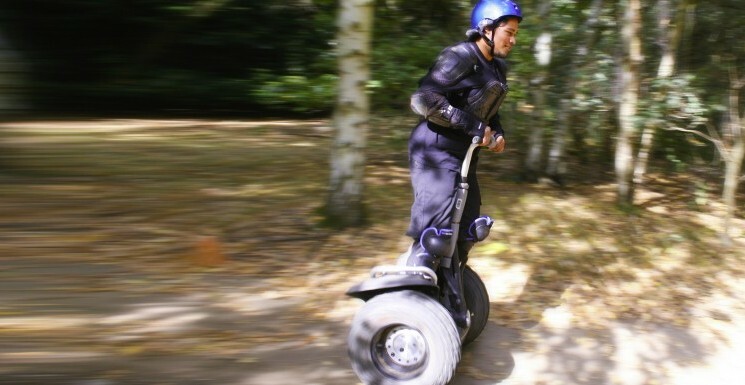 They provided me with a free Segway Rally experience at SegKind – RAF Museum Hendon.